Brahma desired once to have the darshan of Lord Sriman Narayana as an archavatharamoorthi in an enchanting form with four arms bedecked with celestial conch, chakra, cub, and abhayahastha and decided to perform an Aswamedhayaga at Kanchi to cherish his desire. At that time Goddess Saraswathi had a misunderstanding with Brahma and stayed away from his company. So Brahma had to perform the sacrifice in Kanchi even without having Saraswathi by his side. Hence Saraswathi got angry and decided to cause impendiments to the sacrifice started by Brahma. She deployed an army of demons who were all annihilated by Lord Vishnu. She then sent a Sarabha, a peculiar type of ferocious beast. Lord Vishnu had to take a superhuman form with eight arms equipped with eight weapons to destory the Sarabha. Lord Vishnu in this form came to be called Ashtabhuja perumal, meaning the Lord with eight arms. At a distance of two kilometers from Lord Varadaraja's temple in Little Kanchipuram is the temple of Ashtabhuja perumal, situated opposite to the temple of Sri Yadokthakari. It is located in Hodgsonpet, and is in Thirukachinambi street near Rangaswamy Kulam. Ashtabhujaperumal is seen here beneath Chakragosha Vimana in a standing posture facing West. The form of Lord Vishnu with eight arms bedecked with celestial weapons is captivating. The four arms on the right are adorned with Sudarshanchakra-the celestial wheel, sword, lotus flower and arrow while the arms on the left are adorned with the celestial conch, bow, shield and cub. Just in front of the presiding deity is seen the processional diety (Utsavamoorthy) with Sridevi and Bhoodevi. adjacent to this Utsavamoorthy, there is another processional deity called Sri Gajendravarada. There is a sacred tank called Gajendrapushkarani in front of the temple on the left side. The unique feature of this temple is that this is the only vaishnavite temple in Kanchi where there is paramapadavasal, the gateway to paramapadam. There is a mandapam with four pillars called the Friday Mandapam behind which is the sanctum of mother Goddess Sri Pushpakavalli the consort of Sri Ashtabhujaperumal. It is customary here to worship this mother Godess first before going round to worship the Lord. There is also a sannidhi for Sri Varahamoorthy within the main sanctum of this temple. 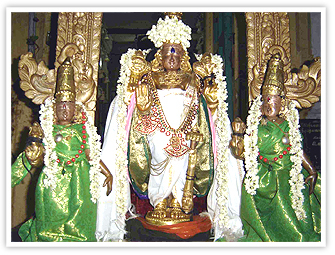 Sri Varahamoorthy is seen here having his consort on his left lap and keeping his right foot firmly placed on the ground and his left foot on the hoods of two serpents. Just outside the temple are the sanctums of Sri Andal facing the east and Sri Anjaneya facing the south. The Pallava kings improved the temple by doing a number of Kainkaryas. 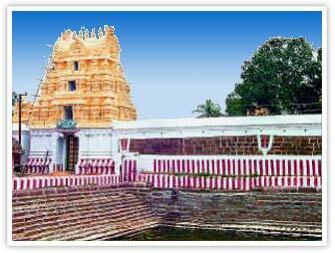 The Brahmotsava of this temple is celebrated in the month of Chithirai. The Gajendramoksha festival is also celebrated in this temple in the month of Adi (Ashad) in the asterism "Hastham". A number of devotees visit this temple every day with prayers to Sri Ashtabhujaperumal to save them from fear and bestow the courage to face the problems of life and succeed in their pursuit for prosperity and peace. The deeds of the Divine are wonderful, and captivating. Sometimes God subjects His devotees to severe test with the intention of bringing their noble traits to light, to make the world recognise their greatness and the superiority of their devotion. The places where such divine acts of the Lord are exhibited; are considered sacred and temples are constructed there for the Lord in commenmoration of that divine happening. Such divine sports are performed both by Lord Vishnu and Lord Siva. Such sports by Lord Vishnu are described as Leelas and those of Lord Siva as Thiruvilaiyadalgal. If Alwars have sung in priase of such Vaishnative temples they are called as Divyadesams. If the four Saiva saints known as Naalvar have sung in praise of the Sivakshethras they are called Padalpetra Sthalangal, the sacred places which were hailed by one or all of the four saints, Appar, Thirugnanasambandar, Sundarar and Manickavasagar. 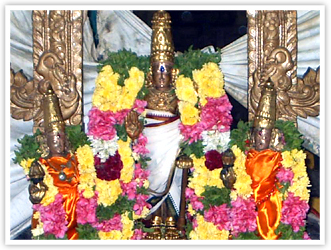 The noble devotees graced by Lord Siva are known as Nayanmars. One such sacred place is Sri Muktheeswarar temple in Kancheepuram and one such greate devotee Sri Thirukuripputhonda Nayanar. Once there lived a washerman in Kancheepuram who was a devout saivite with remarkable traits and virtues. There was not trace of egoism whatsoever in him. He used to render selfless service to all devotees of Lord Siva by guessing their bent of mind correctly with intution and fulfiling their immediate needs. Hence he became to be popularly known as 'Thirukuriputhondar'. His usual service was to wash the clothes of the devotees of Lord Siva who came on pilgrimage to Kancheepuram. He used to do this service voluntarily without expecting any return benefit. Once in winter season, Thirukuripputhondar met an aged devotee of Siva whose lustrous body was completely besmeared by sacred ash. But he was wearing dirty tattered clothes. Thirukuripputhondar was deeply moved by this sight. He prostrated before the old man and requested him to grant him the privilege of washing his robes for him. The aged devotee of Siva had no spare dress to rely on and so hesitantly agreed to entrust the job to Thirukuripputhondar provided he would undertake to handover the washed clothes back to him before sunset so he would not be made to expose himself to the biting cold of the winter night. Agreeing to this, Thirukuripputhondar collected the tattered dirty clothes of the aged devotee and went to the tank to wash them. He took great care to prevent any further damage to the already tattered clothes, washed them well and kept them spread for drying in the bright sunshine. A few moments later, the sky was overcast and there was a heavy downpour of rain. The unexpected non-seasonal rain dampened the wet clothes and disheartened Thirukuripputhondar. He simply stood gazing at the sky. As it was drawing towards sunset, Thirukuripputhondar's body trembled in the cold while his mind trembled in fear at the thought of committing the sin of breaking promise to the aged devotee. The very thought of the old man shivering in bitting cold, approaching the thondar for the washed clothes and his inability to handover the same made Thirukuripputhondar tremble in dismay. Like all noble souls who prefer to shed their lives rather than dishonour the plighted word, Thirukuripputhondar decided to commit suicide by striking his head against the granite stone used for washing the clothes. At that moment, Lord Siva appeared before him to make a timely intervention and reveal that the aged devotee was none other than Himself. Lord Siva praised the noble qualities of Thirukuripputhondar and asked him to continue his noble service assuring him of mukthi or liberation at the end. Lord Siva consecrated in the temple on the spot where this Thiruvilaiyadal occured came to be called 'Muktheeswarar' and Thirukuripputhondar came to be known as 'Thirukurippu Thondanayanar'. The temple of Sri Muktheeswarar is situated in Gandhi Road in Hodgsonpet very near to javulikadai Chatram. There is another sanctum of Garudeswarar in this temple. To the east of this temple and opposite to the Government Hospital, there is the shrine called Kanchi Thirunerikkaraikadu in a place called Thirukkalimedu. The Lord Siva here is said to have been worshipped by lndra and Thirugnanasambandar of the Naalvar has sung in praise of this Sathyanatheswarar. Pilgrims to Kanchi visit the temple of Sri Muktheeswarar and carry with them the thoughts of the noble service of Thirukurippu Thondanayanar and the abundance of Grace of Lord Muktheeswarar, registering the saying in their mind that service to Humanity is Real Service to God.